This book is organized into three parts. You can and should read them in any order. The idea is that you use it as a reference book, reading some parts today, a few more tomorrow, others may be never if you don’t care for them. Go ahead and underline, take and make notes, use it as a reference to prepare a meeting or a workshop; or to get ideas for your next presentation or class. Or just read it for the pleasure of discovering the unwritten rules and the secret codes of a world you have always lived in, with rules you have lived by. Part 1. Individual psychology and the development of personality. This chapter covers the basic concepts of individual psychology and personality theories. You do not need to become a shrink in order to talk Corporate Culture, but the whole process of its creation and evolution can be better understood through the lenses of individual and social psychology. So we will discuss Freud and Jung, get enough material to crack the process and its mechanics, and on the way there, you will also gain some basic psychological concepts which for sure will prove useful on many other areas of your life, both private and business. As we get into psychology we will also explore how motivation and reward work and interact, and we will even take a quick shot at defining happiness. And no, we have no formulas to become happy in three weeks and four lessons, but we will at least try to understand what’s behind that so-many-times-elusive feeling of completeness and, well, happiness! Part 2. The Mechanics of Corporate Culture. In this chapter we go from psychology back to business, back to management. We will explore how the whole thing of Corporate Culture works: how it is created and how it evolves through time. We will look at the various theories and frameworks, but not in a scholastic way but rather with a business mind. We will keep it pragmatic and aim to provide you with tools and resources to apply Monday morning at the office. Understanding how it happens, how it is created and what may cause it to change, will provide you with a theoretical framework and down to earth ideas to work with your teams, organizations, and if you are a consultant, with your clients. Part 3. The Organizational Archetype Survey (OAS)®. 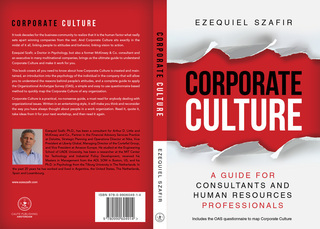 This chapter constitutes the toolbox of this book, a step-by-step explanation of a simple to apply, straightforward, questionnaire-based method to map Corporate Culture. We will first cover all the details of the theory behind the survey. A theory you do not need to know, but may enjoy reading it to gain a more in depth understanding of the mechanics of the method. You can study all the knots and bolts behind it or just go for it and apply the questionnaire directly. It will be your choice whether or not to get into the details. It will work both ways. You will also notice that the value of this survey lies not only on the results it provides, but also in the process of thinking together with your team, in generating the conversations around your organization’s Corporate Culture, on how things are done at your company, how people are rewarded, what is considered bad or good, and why. The output of the OAS questionnaire is not the end result we are looking for, but rather all the learnings coming out of the process of applying it.